WOW this has been a long stressful week and I'm glad to see it come to an end. Looking forward to a nice relaxing weekend....We're going to start decorating the outside of the house tomorrow for Christmas. Ethan is extremely excited, he's been talking about it for days. I have to give my hubby some credit on this project. I got as far as painting, covering and putting the metal letters on the box, then I got stuck. Scott came up with the rope idea, the lock, and coins hung on the side. First I took a paper mache treasure box and painted it brown, then white washed it with some watered down white paint. Then I look some Basic Grey Marjolaine paper measured and trimmed the sections to fit. I sewed along the edges of each section and then used walnut stain distress ink to edge the pattern paper. Once I had the paper sections glued down with mod podge, I started embellishing the box. 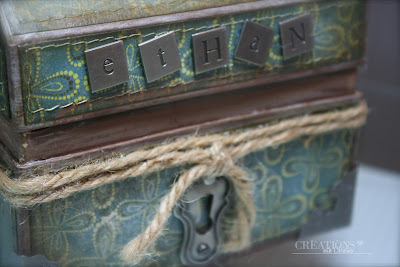 I wanted to keep it simple and not too little boyish...Added the metal Ethan letters, a Tim Holtz lock and corners. 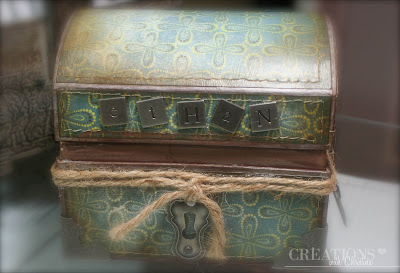 Then added the rope and Tim Holtz coins on the sides. I love it. I would of never of known it was paper mache until you mentioned it. Wow this is a super look for a lad, it is not too babyish but at the same time not too old either. Perfect colours and papers. This is absolutely adorable well beautiful. I love all of the ideas that were put into the box. I am sure Ethan loves it too. Great job. i just love this box for Ethan's coins. this would made an awesome gift for someone i know. great job, have a good weekend, and happy decorating. great project! Thanks for sharing!! Always looking for boy ideas!! I think this will be the box he treasures into his adulthood. The things he'll keep in it will change, but they will be treasures none the less. What great memories you are creating for Ethan! What a great idea! Turned out great, I may just be lifting this idea for my great nephews! Or even the great nieces, it could be made up very girlie too! This is a terrific idea for my nephews - it's always easy to do something for my nieces, but coming up with something "boyish and not babyish" is sometimes hard to do. Great job!! What a beautiful and timeless piece one I am sure he will treasure (no pun intended). Ethan will surely pass it on to his family when he is all grown up but for now....I pray that he will overflow his beautiful new savings chest! Wow, it's great. I know he loves it and will for a long time. Everyone needs a treasure box, we all have them they just change through the years. Great job. I had something similar when my son was his age. It's a great place to keep their most favorite things. Love the treasure box!! 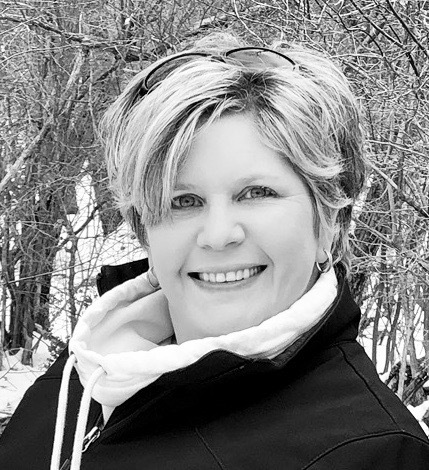 And compliments to your hubby too for contributing the idea(s). Have fun decorating the outside of your house for Christmas! Thanks for sharing. Christina, this is fabulous. You have one lucky lil guy! My grandson will be 3yrs old day after Christmas and this would be PERFECT for putting his gift in. I have a larger paper mache trunk...thanks for the idea - you're the best. This is a great treasure box that is not babyish at all. It will be cherished for a long long time. Christina - This is gorgeous. I know Ethan probably loves it. So boyish. And if Ethan doesn't like it, tell him I would gladly take it off his hands. haha. Oh my gosh, I love this treasure box. This would make nice a nice Christmas present for a few of my family members with a little something something on the inside for another special treat. Ethan's treasure box is absolutely an outstanding masterpiece. WOW like so many others expressed! Hey your hubby did have some excellent ideas too. Two great minds working together!! Great JOB! 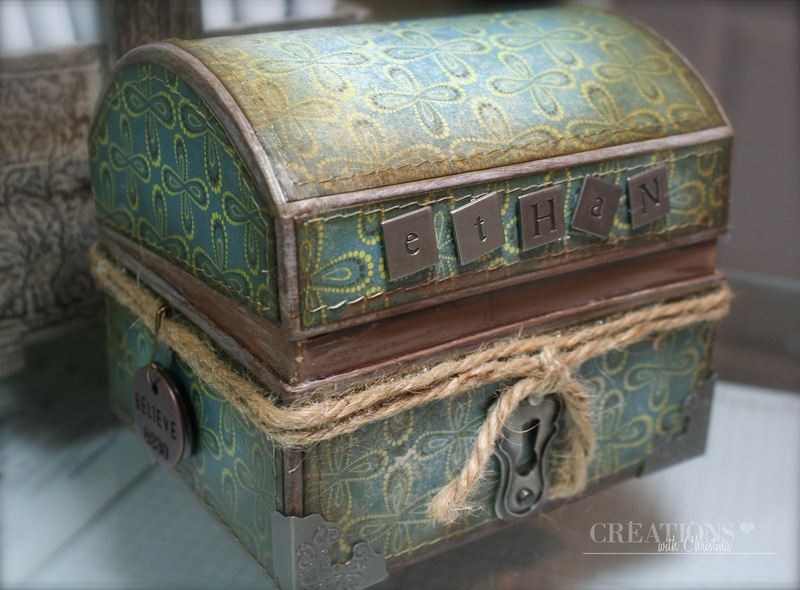 Ethan's treasure box is so cute. On another note just want to say Thank You Thank You & Thank You for the Gypsy series you did. Just got done watching all the video's. I learned a lot. I bet he loves it!!!! Wow Christina! This is BEAUTIFUL!